RapReviews.com Feature for April 17, 2007 - Lil' Flip's "I Need Mine"
Lil' Flip is back! After delaying his album for over a year, "I Need Mine" finally sees the light of day. Well, at least officially since Lil' Flip was one of the first victims of an album leak as his entire Sony release was leaked before planned and cause his initial delay – label buy out – Asylum signing. Of course, there had to be a little more going on than a mere album leak since Slim Thug and Lupe Fiasco recovered from a similar leak and remained amicable with their label. Most likely Sony was tired of defending lawsuits from musicians claiming Flip's producers used their music without permission. Whether it was Flip's fault or the producers, Flip and Sony had to shell out mad dough to the Pac Man people as well as defend a lawsuit by a Texas musician who claimed Flip used his music on multiple tracks. Even if Flip had prevailed in all suits, legal help is not cheap so Sony likely decided to cut its losses. Trying to make the best of the situation, Flip hits us with a 2-Disc set in 2007 consisting of tracks from the original leaked album (which he bought back from Sony) and new tracks recorded exclusively for the Asylum release. The result is yet another Flip double disc (every one of his albums had at least a limited edition double disc version released at some point) and a treat for the fans who get twice as much for the same dough. While Flip doesn't outright state it, "I Need Mine" is divided into Disc 1 which is the "new" version of the album and Disc 2 which is the version leaked over a year ago. If you are looking for super-producers, Disc 2 is the way to go as Scott Storch, Mannie Fresh, Salaam Remi, and Three Six Mafia all contribute tracks. Disc 1 is not to be taken lightly either though as Three Six Mafia, Carnival Beats, and DJ Squeeky make contributions. In the spirit of Flip's last album, a relatively unknown beat collective handles the duties on most of the first disc in the form of The Synphony. As with Play and Skillz before them, The Synphony are capable of producing hits in the form of the first single, "Ghetto Mindstate," but also miss at times. The Rick Ross featured "I Get Money" comes off sounding annoying with its stripped down sound and high-pitched chirps. "Playa 4 Life" is definitely worthy of radio play, but the high-pitched synths sound a lot like those on the last Chamillionaire radio hit with Ciara. Other producers generally fare well on the album, including Flip himself. "Fly Boy" has the signature Texas sound with deep bass and funky synths and is produced by Flip. Carnival Beats on the other hand continue their assault on the Texan airwaves with "Starched and Cleaned" as Big Pokey and Lil' Keke stop by to create a certified Texas banger. Overall, the production is on point throughout. With 37 tracks total, there are bound to be a few sub par efforts, but not enough to complain. Flip himself has changed his style a bit this time around and it shows the most on the first disc. The Flip of old was known for his humor, but humor isn't even a marginal part of this album. If you ever heard "I Can Do That" or "This Is the Way We Ball" you know that Flip is at his best when he takes a light-hearted approach to the music. The closest we get to this is on Disc 2 where flip calls out those who spend money on girls on "You'z A Trick." Whether Flip was trying to mimic the rest of the industry, trying to be more mature, or simply pissed off after all the legal/label drama, his sense of humor isn't present on "I Need Mine." The lack of humor takes away what was one of Flip's unique characteristics but luckily Flip makes up for it with solid music. If you want songs on a more serious social tip you just need to check out "Ghetto Mindstate," "We Go Make It Out Da Hood," and "Single Mother." For tracks dedicated to the ladies you can choose between "Tell Me," "Sorry Lil' Mama," and "Take You There." Texas anthems about hustling, leaning, and balling can be found in the form of " Starched & Cleaned," "Fly Boy," "White Cup," and "Stay Ballin'." Flip even gets real deep on "Hall of Fame Graveyard" where he reminisces on all those that have passed, especially those that passed in between his last two albums. It's actually a shocking wake up call when you hear how many cats have passed in the rap game since "I Gotta Get Mine." 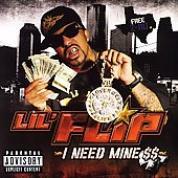 "I Need Mine" is Lil' Flip's best album to date and yet it isn't. Even with the scarcity of humor on the album, if you put all the best songs on the double disc together you would have Flip's best album. Yet you can't ignore the fact that this is a two disc set so you can't ignore the remaining songs. Had Flip charged a double disc price for this then I'd dock points, but given the fact he's giving you all this for the price of a regular CD you can't knock him. Considering some rappers can't deliver even one CD of average material, this is a great effort by Flip. The only warning to the consumers is that the two disc version is being labeled the "Limited Edition." So if there are plans to release this as only a one-disc version I'd go and cop it now so you won't miss out on all the great music on the second disc.